A short film featuring a speech by President Harry Truman during the Cold War. See the video on YouTube. Excerpt of General Dwight Eisenhower’s July 8, 1948 speech for a United Nations Crusade for Children. Eisenhower talks about the importance of ending child hunger in the quest for peace, a theme still very much relevant today. View the video on Youtube. A group of non-governmental organizations (NGOs) are calling for international pressure on South Sudan‘s leadership to end the nine-month civil war. A statement from the group was released yesterday ahead of a United Nations meeting. 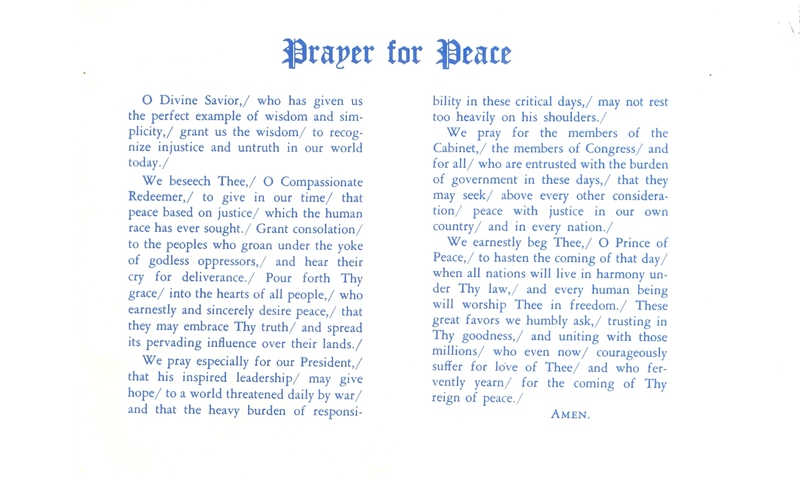 In September of 1961 the Archdiocese of Washington held a Crusade of Prayer for Peace. At this time the Cold War was well underway and the Soviet Union had recently tested a massive nuclear weapon. The United States would soon resume its nuclear test explosions as well. The Cuban Missile Crisis would follow in a year. I found the prayer card in my late mother’s Saint Andrew Daily Missal. She lived in the Washington, DC area at the time of the Prayer for Peace event. To read the prayer click on the card below. India and Pakistan, two nuclear weapons states, need to build a lasting peace. The two nations suffer from extreme hunger and poverty. This will persist as long as they pour their resources into a costly arms race. Back in 2004 I wrote about one confidence building measure the two rivals should adopt on the road to peace. Hopefully in 2012 it will take place. Here is a copy of the article as it appeared on History News Service and History News Network. There’s encouraging news about ending the decades-old conflict between India and Pakistan. At the United Nations, the leaders of both nations recently expressed their desire for peaceful coexistence, and called for confidence-building measures. How crucial is this development for the United States? Extremely. The war against terrorism cannot be won without stability in South Asia. Now is the time for the United States to intensify its efforts to help establish peace between the two rivals. India and Pakistan are both armed with nuclear weapons. The two nations have frequently exchanged gunfire in the region of Kashmir, which both claim. In 2002, when hundreds of thousands of Indian and Pakistani troops massed on their respective borders, war seemed imminent. South Asia was on the brink of a nuclear catastrophe. The crisis subsided but the urgent need for peace between the two adversaries remained. How can the United States aid the Indian-Pakistani peace process? By means of an old Cold War initiative, originally proposed by the United States. In 1955, in the midst of the Cold War, President Eisenhower presented a diplomatic surprise to the Soviet Union. Why not allow both the Americans and Soviets to fly unarmed aerial observation missions over each other’s military facilities? Such a move, the president surmised, could reduce the possibility of secret military preparations and help build trust through transparency. As Eisenhower stated, “Open Skies” would have the effect of “lessening danger and relaxing tension” between the two heavily armed rivals. The Soviets didn’t accept Eisenhower’s idea in 1955. In fact, it took nearly 40 years to implement it. 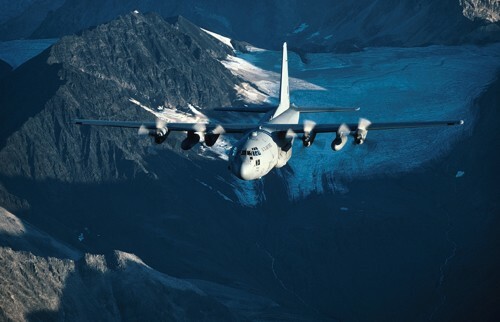 In 1992 the United States, Russia and other European nations signed the Open Skies Treaty allowing unarmed aerial observation missions over the respective territories of each nation. A similar arrangement would benefit India and Pakistan, who fear each other’s military might. Open Skies missions would provide that Indian and Pakistani officials work together on observation flights. This type of cooperation would set the groundwork for future disarmament agreements. Increased cooperation was Eisenhower’s intention when he unveiled Open Skies. He said at the time, “What I propose, I assure you, would be but a beginning.” His proposal was not by itself going to end the Cold War. It was a confidence-building measure similar to what India and Pakistan have called for at the United Nations. A joint Indian-Pakistani statement emphasized that such measures could develop “an atmosphere of trust and mutual understanding.” This was the very basis of Eisenhower’s original Open Skies proposal during the Cold War. The security of the United States is greatly affected by relations between India and Pakistan. A successful war on terrorism cannot be carried out without stability in South Asia. Pakistan and Afghanistan form the major front on the war against terrorists. The remnants of al-Qaida, and possibly Osama bin Laden himself, are in that area. For the international community to finish off al-Qaida, uninterrupted cooperation from Pakistan is a necessity. An escalating conflict with India would only draw Pakistani attention and resources from the war on terrorism. The United States must use its best diplomatic tools, such as Open Skies, to assist India and Pakistan. The use of diplomatic measures, great and small, cannot be overlooked as an essential tool against terrorism. The furthering of peace and economic prosperity worldwide will make terrorism less likely to prosper. There are other reasons for the United States to be heavily active in promoting peace between India and Pakistan. The gravest risk facing South Asia is nuclear war. Both India and Pakistan tested nuclear weapons in 1998 and possess effective missile capability. One nuclear strike could kill millions and bring about a nightmare of unimaginable proportions. A step-by-step process toward nuclear disarmament in South Asia is imperative. Clearly, a stable Pakistan at peace with India is in the best interests of the entire world. Adopting an Open Skies agreement will help create the atmosphere India and Pakistan need to resolve their disputes. Its successful implementation would set a formidable model for arms control and peace that other regions of the globe could emulate. The United States and NATO can offer considerable expertise to help formulate the agreement. An Open Skies initiative will help lay the foundation for amicable relations between India and Pakistan. This is one of many steps that will be needed to achieve peace in South Asia. The stakes are high. A failure to resolve the differences between India and Pakistan will prolong tension in South Asia, increase the chance for war and rob valuable time and resources from the fight against terrorism. Article originally distributed in 2004 by the History News Service.